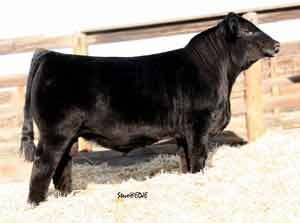 Sweet Meat was the stand-out yearling bull in the 2008 Yards "Pen of Bulls" Show. 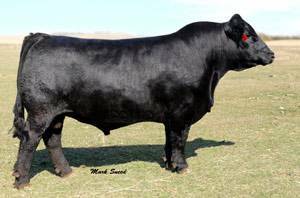 He was admired by many purebred and commercial cattle producers for his overall balance, performance, and style. Sweet Meat sold for $20,000 to Hart Farms, SD. Sweet Meat combines the great type of his sire with the stoutness, body mass and muscle shape of his maternal grand-sire. He is tested Homozygous Polled & Homozygous Black. Sweet Meat has flawless structure and is excellent on his feet & legs.